After our recent trip to Metro Detroit I wrote a post called "The Ageless Wonders", which I hope you enjoyed reading as much as I enjoyed writing it. There is another story that I will write after this one about My return home and I hope you enjoy this Three-Part Series. Today's theme is a Special One. It features two incredible places. The Pontiac Silverdome and The Highland House Restaurant. We'll begin with the former home of the Detroit Lions, the Pontiac Silverdome. I really believe the City of Pontiac, MI, really blew it when Lions Owner William Clay Ford wanted to renegotiate the lease and they failed to do this. You can say what you want about the Lions success on the field or lack there of, but nobody will ever accuse Ford of threatening to move the team out of Michigan if he didn't get a stadium. I've covered enough football throughout the years and have seen it happen. A couple areas that stand out are Houston, Texas, where the Houston Oilers eventually moved to Nashville, Tennessee. Art Modell moved his Cleveland Browns to Baltimore. Both cities would eventually get NFL teams, but they paid a steep price to get them back by building new stadiums. But Ford was looking to get a better lease and bring it up to NFL revenue standards so he could eventually pay for a franchise QB like Matthew Stafford. When Pontiac failed to come through, Ford moved his team back to Detroit and the Lions play in a dynamite facility, Ford Field. When I took my wife to Michigan, we drove by the Pontiac Silverdome. This is a building that was eventually sold for pennies on the dollar and deteriorated over time. It was an eyesore when you drive down M-59. It took two attempts to implode it because that's how well built the Silverdome was. Every time I would drive by the Pontiac Silverdome, I would ask myself, "What If" Pontiac had done the right thing for the dome which had many big events and a capacity of 80,000? This is a facility that I had lots of memories not only as a fan early in my childhood, but as a member of the media. I saw a lot of football in this venue plus some Detroit Pistons games. When I was living in Michigan, I knew where My Sundays were being spent. The Monday Night Football games were great. Covering the Thanksgiving Games was an event I looked forward to doing. Whether the Lions won or lost, I had my permanent seat in the press box and the parking for the media was a breeze. My football ritual would be arriving around 3-4 hours early and then preparing for the game. Whether I was talking to other media members, coaches or other prominent people that I could plug into my stories, there was never a dull moment. There would be the game and then post-game interviews. My game days at pretty much any sporting event range between 7-10 hours. I enjoyed watching Barry Sanders run his way into the Pro Football Hall Of Fame, taking a photo of Gordie Howe when I was in a sling, plus watching a lot of explosive Lions football. There would be the career ending injuries of Mike Utley and Reggie Brown. 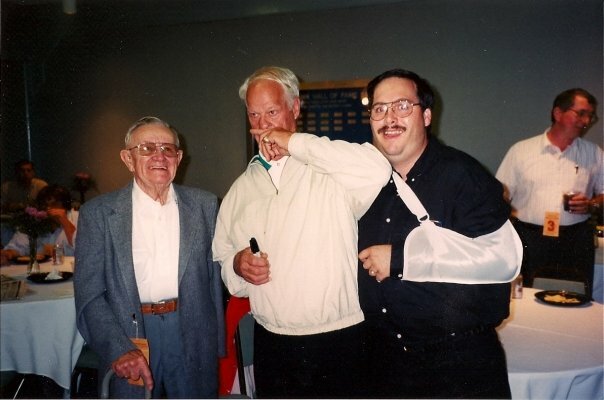 The photo with Howe was taken in the media dining area and I was also with long-time Lions Broadcaster Bob Reynolds. I once did an interview with former CBS Pro Football Hall of Fame Sideline Reporter Lesley Visser, who was one of the pioneers for women in Sports Media. She was an absolute sweetheart. I wish there were camera phones back then because that would have been a photo for the ages. The NFL Draft was interesting as we'd spend 10-12 hours at the Lions offices on Saturdays and Sundays watching the ESPN Broadcast, flushing through the countless media notes, talking to not only the head coach but the assistants. There would be a press conference after every pick or trade with the head coach. I have to admit that by talking to the coaches, I learned a lot about football. The Lions made sure we were well fed as there was no shortage of food. But aside from the memories on the field, I met and worked with a lot of great people within the Lions organization. A few that stand out were Bill Keenist, Mike Murray and James Petrylka Sr. I see Bill when I cover the Lions on the road. James moved to Tampa, FL, and I see him when our paths cross at football games in the state. The photo with Petrylka Sr. was at a recent Jacksonville Jaguars game in Northern Florida. I value all of these three people as real great friends. From The Pontiac Silverdome to The Highland House. These two places are a 30 minute drive on M-59 and for many years there were not many restaurants on this thoroughfare. Thus the Highland House would gain customers on Sundays especially those that took this route back to cities en route to Lansing, MI, which is Michigan's capital. I have an incredible history with the Highland House. My cousin Ron Kroll introduced me to one of the Owners Elia Nicholas. I've known Elia for over 40 years. He's like an older brother to me and has a heart of gold! He would give a person the shirt off his back if they needed it. I became very familiar with this restaurant when my parents, who lived in Southfield, MI, at the time used to take a 45 minute trek to Highland when they owned and rode horses. They eventually moved us out to Highland, MI. Before we moved, we always ate at the Highland House. In 1978, Elia hired me to be a Salad Maker. In this photo, I couldn't resist the opportunity to take a photo in the Salad Area to hold a salad like the good old days. On this day, I wouldn't ruin my clothes with the Highland House's incredible house dressing. Elia did give me two bottles to take with me but they'll never be opened and are in my trophy case at home completely sealed. Elia and I have had lots of memories through the years. When I would come into the Highland House, his first question with me with a smile was, "Are You Hungry instead of asking, How Are You?" This was neat because he's a guy in the food business and his job is to feed people. When he had a restaurant in West Bloomfield, MI, called E.G. Nicks, we'd spend time together there as well. I worked at the Highland House through High School and I would come back from college to earn extra spending money. The Highland House was my first job. They threw me a going away party when I moved to Florida in 1981 to continue my education and it was an incredible experience. I would later work at the Highland House as an interim manager in the kitchen in late 1986 then as a consultant from 1987-1999. When you talk about the restaurant business, this family has it figured out down to a science. In 1976, the Highland House, which is located at 2630 Highland Rd, in Highland MI, opened it's doors. Tom Nicholas, Elia, Steve Ryeson and his brother Gene were the owners. Tom's lovely wife Despina was the hostess and her heart was bigger than the Good-Year Blimp! Elia's sister Elizabeth was involved before she would move on to another family restaurant. On our trip to the Highland House, Elizabeth's daughter Despina Nevells joined the team to work in the marketing department. I had the good pleasure of working with Elia's late younger brother Greg, who died at 49 because of Cancer. To this day, it kills me internally that Michigan never had the Clean Air Act like we have in Florida which prohibited smoking in a restaurant. After Greg's passing, Michigan did add the Clean Air Act. There were other people that I enjoyed seeing and working with through the years. Abraham Ryeson was Steve's and Gene's father and his sense of humor was off the charts. I always enjoyed working with Jeff Ryeson. His brother Gregg Ryeson is one of my best friends! Gregg actually lives in South Florida and last year, his beautiful Wife Michelle and My Princess Candy got together at Duffy's in Boynton Beach, FL. Gregg and I reminisced about the incredible memories we shared at this Iconic 42-year old Restaurant that opened in 1976. Our wives really had fun listening to the good old days and the four of us made a goal to see one another more since we live in the same area. On our visit, there was one familiar face in the kitchen. Chris Burke (on the left), who I am in the photo with has been working with daytime preparation dating back to my days in the kitchen. He says the job never gets old, is comfortable working with ownership and knows he'll always be taken care of. Chris looks fantastic. Gene recently relinquished ownership to his son Rob (on the right) and this guy is like a younger brother to me. Like his dad, he's an unbelievable person and will be counted on to continue the Highland House's magnificent tradition for years to come. There is no question that Rob and Elia will make an excellent one-two punch! One of my favorite stories which draws laughs is the time I grabbed an extra time card to record my hours and Tom Nicholas saw me doing this in the break room. In his ruffled voice, he says "those time cards cost me six cents apiece." I pulled the six cents out of my pocket, put it on the table and he grabbed it. I told Elia and Gene about this and we started to laugh so hard that we nearly started to cry. I swear, this was the best monetary laugh I've ever had in my life! Even Gregg and I talked about this to our wives at Duffy's. To date, we still couldn't believe it happened. For years, Steve Ryeson would have some of my sports photos in his Sports Room so his customers could see them. But when I return to The Highland House, the majority of the time I spend is with Gene and Elia. When Gene's wife Diane was alive, no trip would be complete with her as we exchanged hugs and talked. She's a polished diamond of a person! I'm glad that Candy has spent time in The Original Highland House and won't depend on my own memories as to what it was like. Like the Silverdome, the Original Highland House will have a date with the wrecking ball. It will become a parking lot. This building is actually 100 years old. It was once a truck stop, then became The White Duck Restaurant, Nick's Big Platter and then the Highland House. When I return, it will be different because I'll have to get used to a totally different atmosphere. A State Of The Art Atmosphere. This happens all the time in sports when older arenas get torn down and the new ones are built. But one thing will always be consistent about the Highland House. When I tell you that these people have the restaurant business down to a science, I really mean this! This restaurant reminds me of Cheers, where everybody knows your name. At the Highland House, you'll always see that familiar bartender as turnover at this position is very rare. In this photo of Elia and I, John Brodie is listed as a bartender that's been with the company several years. He is a great person and it was unfortunate that we didn't see him on this visit. The original owners were always present and they knew there regular customers by name. When I sent them customers and told them to look for a particular person, these individuals were there on their specific days. Elia is a workaholic and never goes out of town. Then again, when you love what you're doing for a living and making a good living and are comfortable, then he doesn't consider it work. For years, Elia used to have business interests with former Detroit Red Wings Owner Mike Ilitch, who was the founder of Little Caesars Pizza. Ilitch died on February 10, 2017. These owners go out of there way to sit with there customers and make the experience and food right. They're known for their Ribs, Garlic Bread, Pizza and Greek Salad with the Special Dressing. It can be ordered online. The Highland House owners and staff have treated every vendor, customer and employee as an extension of their family. As for Myself, Elia and Gene are Gold To Me! Their love, friendship and my growth as an individual is something that is unforgettable! Elia and Gene are extended members of my family! As I've mentioned before and am proud to say it again, Elia is the older brother I never had while Gene is a Jewel of an Uncle! I'm glad that Candy had an opportunity to spend time with Elia and Gene! I've made other friends through them such as Gus Pantelides and Mike Pantel. Both of them live in Clearwater, FL, and I see them periodically when we go to the Tampa Bay Area. But if you want to open up a restaurant, The Highland House is the model you want to follow! These people have gotten right for years and the future has never looked brighter! I'll miss the Pontiac Silverdome and Original Highland House, but what a Nostalgic Return on a chilly but dry December 7, 2017 in Southeastern Michigan. Scott Morganroth can be reached at www.scottsports33.com and is a member of Detroit Sports Media. In sports, aside from interviews, there is usually one way to tell a story. The numbers never lie and in life that's the common denominator. My wife and I were back in Metro Detroit for a few days in early December of 2017. We were extremely busy the entire trip as I always am when I return to Michigan. Unfortunately, I haven't had the opportunity to come back home in recent years therefore, to pile what I need to in three days, I'd need 48 hour days to put a dent in what I'm attempting to accomplish. With family, friends and my media commitments, my schedule fills up real quick, thus there is an extremely tight window to fit things in my itinerary. I spend days planning the trip writing things down and calling the people to make plans as every minute counts to come up with a comprehensive calendar. Those that stay in touch the most get high priority when I return home. Those that don't stay in touch get bypassed. It's easy to stay in touch these days with text messages, phone calls, e-mail and Facebook. On December 7, 2017, this was an Incredibly Unique Day. My wife and I contacted My Mother to wish her a happy birthday. It would have been great if she was in Michigan to celebrate, but because of our vacation time, timing didn't work out. Nonetheless, it was great to hear her voice and she was in outstanding spirits. The tone in her voice was evident that she appreciated the call. Ironically, this day brings back other special memories. My wife and I went on our first date. Thankfully, this was the last first date I ever went on and I am forever grateful as to how things have turned out. The day started out with seeing some long time close family friends, Max and Nancy Spector, who had the opportunity to meet my wife for the first time. They were kind enough to meet us at the hotel and we spent about 90 minutes with them. We took a group photo with them. From there, the Victory Tour continued as Candy and I made a 40 minute trek to Bloomfield Hills, MI, to see the First Ageless Wonder, My Aunt Mary Must. Aunt Mary is 98-years old and after spending about an hour with her, anyone who couldn't recognize that this woman is as sharp as she is needs to invest into a dunce cap. Her family owned a successful dairy business and recently sold it. She worked there and this gave her a sense of purpose. When an individual can keep their mind active at any but especially a later age, that's an extremely healthy situation! We had a great time getting caught up with Aunt Mary and she loved Candy! Then again, everybody loves Candy! Thankfully, Aunt Mary's sons Alan and Joel Must, along with her daughter-in-law Suretta keep tabs on her. They take her to the doctor and make sure that all of her shopping, etc... is handled. This day was tough for Aunt Mary as her late daughter Madelon Seligman died recently at the age of 74 because of Cancer. She was born the same day as my mother in 1941. Aunt Mary's walker has a photo of Medelon on it. I don't know of an existing family member that has ever lived to be 100-years old and I hope Aunt Mary becomes the first. Despite Madelon's birthday, she was smiling that we were there and when we come to town in the future, there will always be time for this remarkable woman! The Second Ageless Wonder is 85-yard old Gene Ryeson. Here is another person who looks in fantastic shape. He is the former owner of the Highland House in Highland, MI. He turned over his ownership to his son Rob. Despite relinquishing ownership, Ryeson is a silent partner of this 42-year old Iconic Restaurant located 30 miles away from Pontiac, MI. He shows up on a regular basis to greet customers and always monitors the books. Gene Ryeson is another example that an active mind keeps him impressively on the road to the glorified century mark. There is no doubt that Gene still feels a void since the loss of his late wife Diane, who was one of the nicest people you can meet. There aren't enough words in Webster's Dictionary that can define how genuine Diane was. I truly loved Diane! Thankfully, Ryeson is around his family, the loyal customers, plus new ones, and his smile is as bright as the Florida Sun. I worked at the Highland House when I was in High School from 1978-81, and when I returned home during the holidays from college, I would work a couple days to have extra spending money. In late 1986, I returned to the Highland House and took an interim position in a managerial capacity to straighten out issues in the kitchen. Ryeson trusted me to turn things around and gave me all the tools and support I needed to get things done. We would work until late at night and I gave him updates. He knew that I would leave in January to take a baseball job as the Director of Public Relations in Gastonia, NC as I worked for the Texas Rangers Class A affiliate which ultimately produced 12 major league players and coaches. He made sure I earned enough money to take a trip to Hollywood, FL, so I can get this job in Sports Administration. Once again, my adopted uncle had an opportunity to spend time with my new beautiful significant other as he would tell her stories of our incredible history together. From late 1987-1999, I worked with Ryeson as a consultant. He always picked my brain when dealing with employees, customers and I was proud to use my Media, Sales, Psychology and BA Degree in Communication from the University of South Florida to brain storm on how to handle situations. We also enjoyed talking about life and when I needed advice, he was there to provide it. A one-in-a-million person and we need more like Gene! Ryeson will continue to be on the Victory Tour when I return home. The Third Ageless Wonder is My Uncle Albert Kroll, who is 90-years old. The last time I saw Uncle Al was at his Sisters and My Grandmother Sophie's funeral in 2000. With the cooperation of My father and Aunt Judy, he was more than willing to let me do the eulogy of my grandmother. And, I was determined to give her a sendoff to heaven for the ages! My Grandma Sophie and I were as close as any two people can be! I'm forever grateful that my family allowed me to be the only speaker to do the eulogy. On this night, Uncle Al, Aunt Barbara, My Cousin Ron and his wife Helene met Candy at Buddy's Pizza in Farmington Hills, MI. They gravitated to Candy! In my opinion, Buddy's serves the best pizza in Michigan! There is nothing close! You want to talk about a sharp individual, Albert is it. He founded Kroll Construction in 1961 and I went to their website. He's definitely adapted to the times understanding how the industry has changed in many ways through advanced technology. The methods of doing business is much different these days as sales are more consultative and less high pressure. Yet, this family business is as strong as ever and continues to be one of the longest home improvement companies in Metro Detroit. The potential shelf life seems limitless. Uncle Al told me he works out at 5:30 am and then goes to work everyday. While he's not listed as an officer anymore, his involvement is definitely evident. He's another example of an incredibly active mind at a later age. He remembered a time when he bought me a winter coat and I forgot all about that. We talked about many other things plus these people had the opportunity to meet the newest member of the family. Future visits will include cousins Todd, his wife Jennifer, Brian and perhaps others. I expect there to many more great times with these individuals so Candy can get to spend time with family members that were unable to attend our wedding on January 1, 2017. In horse racing, a legacy is defined by the animal's ability to win the Triple Crown. Winning The Kentucky Derby, Preakness Stakes and Belmont Stakes are what can turn regular horses into icons. The combined ages of these Three Ageless Wonders is 273. This is the most important number of this story with the remarkable longevity attached to these individuals. It's hard to imagine or believe that Gene Ryeson is the youngest of the group at 85, but he is nonetheless. Yet if you look at the photos in this story, they all look absolutely fantastic! Unfortunately, the past 15 years has not been very kind to me with the numerous operations and hospital stays I've had. It's been documented before and I'll say it again that in 2017, I was in the hospital five times, yet with Candy's help, I survived and feel pretty good to date. On this unique date of Pearl Harbor Day of December 7, 2017, the opportunity to spend time with all of These Iconic Group Of Individuals certainly made this an Incredible Trip! I expect more Replays In The Future! The last time I saw a post-season game at EverBank Field was on February 6, 2005 when the New England Patriots edged the Philadelphia Eagles 24-21 on a chilly clear 59 degree night in front of 78,125 to win Super Bowl XXXIX. While I've covered my fair share of games in this venue since then, this post-season contest pitting the Buffalo Bills (9-7) vs Jacksonville Jaguars (10-6) is one with no shortage of story lines. As I mentioned in the last story, Jaguars Coach Doug Marrone served as the Bills head coach from 2013-14. During the week, my media colleagues have touted this game as "The Doug Marrone Bowl." During the season, the Jaguars bolstered their run defense by acquiring defensive tackle Marcell Dareus from the Buffalo Bills. To demonstrate their thanks to Buffalo, Jacksonville inserted Dareus into the starting lineup. Jaguars rookie running back Leonard Fournette bought his offensive line Rolex Watches as he eclipsed the 1,000 yard mark by amassing 1,040 yards in 13 games with nine rushing touchdowns. CBS sent their top broadcasting team of Jim Nantz, Tony Romo, Tracy Wolfson and Jay Feeley to cover the game. Wolfson and Feeley are both Michigan Wolverine alumnus and were assigned to report from the sidelines. But the big story lines with these franchises was their long playoff droughts. Buffalo owned the longest drought in the NFL by sitting on the sidelines since 1999, 17 years. Meanwhile, the Jaguars won their first division title in franchise history and had a 10-year playoff hiatus. Between the two squads, you're looking at 27 years of no playoff football. The one thing that I've enjoyed over the past 13 months is how the Jaguars have made a nice turnaround, coming off a 3-13 mark. During the past two stories, I've talked about what's transpired with this team. The word sellout hasn't been used much while the team has struggled since they appeared in the post-season in 2007. But that word sellout has reappeared at the end of the 2017 season to the tune of three straight and this is just the beginning. With a competitive team, I've always believed that this town would Erupt which is behind the name, Mount. St. Jacksonville. In My Sports Writing career, I've seen a lot of different Sports Towns. The ones which have intrigued me the most are those that are "The Only Game In Town." Some of the teams and towns that have stood out over the years include: The Portland Trail Blazers, Orlando Magic, Sacramento Kings, Utah Jazz, San Antonio Spurs, Columbus Blue Jackets, Vancouver Canucks and of course the Jacksonville Jaguars. Other towns and teams that had one major sports team before they ultimately gained expansion franchises include: The Carolina Panthers, New Orleans Saints, Miami Dolphins, Tampa Bay Buccaneers and Toronto Maple Leafs. These are the places I've seen. There are others which I'm not mentioning at the moment because they're on my bucket list down the road. What amazes me about the Jacksonville situation is they get seven regular season home games in addition to the pair of pre-season games. Jaguars Owner Shad Khan has a home game in London, England, which is also on my bucket list and Jacksonville makes a lot of money playing across the pond. Jacksonville recently extended its deal to continue playing a game in the UK. With this team being in the playoffs, Khan will reap the benefits of his team being a Cash Cow as revenues figure to increase as a result of continued fan support along with merchandise sales both locally and in London. I spoke with a writer from the Toronto Star and he said Khan markets the Jaguars in Canada. Prior to the Buffalo Game, Khan gave away 1,000 free tickets to Puerto Ricans, who were displaced from Hurricane Maria. You want to talk about a hot ticket, the Jaguars vs Bills was just that. Tickets for this game were going for $300 for standing room, while the other AFC Wild Card Game in Kansas City pitting the Chiefs against the Tennessee Titans was $38 per ticket. Regardless of how much the Jaguars fans paid for this game, the "White Towels" were waving at full force. The Titans defeated the Chiefs 22-21 so the financial hit for those fans wasn't high, but the loss stung nonetheless. Before the game, I spoke for a couple minutes with NFL Network Analyst Mike Mayock and asked him what type of game that he expected to see. Mayock was doing the color analysis for Westwood One National Radio Broadcast with play-by-play partner Ian Eagle. He told me that he expected a hard fought and low scoring affair. While neither of us predicted a team, I did tell him that a 17-14 or 21-17 score is what I thought would occur and he seemed to like those scores. That's how evenly matched these teams were. They have QB's in Buffalo's Tyrod Taylor and Jacksonville's Blake Bortles, who were making their playoff debuts. Plus, running backs LeSean McCoy of Buffalo and Fournette are game breakers. How do you impress your fan base and regional following? You win and the Jaguars sent 69,442 people home real happy with a 10-3 win on a clear 53 degree day. Going into the game, Jacksonville was an 8.5 point favorite and the Over/Under was 40. The prognosticators and the gamblers were definitely off base with these numbers. Here are some interesting numbers that stood out in this contest. Buffalo out gained Jacksonville in net yards, 263-230. Time of possession favored the Bills as well leading by a 32:37-27:23 margin. McCoy performed better than Fournette. McCoy had 75 yards rushing and 44 yards receiving. Fournette rushed for 57 yards and added another 21 in the air. On the depth chart, Blake Bortles is listed as a QB, but put on a Halloween Costume as a running back. I can't remember the last time that a signal caller rushed for more yards than he threw for. But that's exactly what happened. Bortles rushed for 88 yards and passed for 87, although he did throw a touchdown pass and didn't throw an interception. For this story, I've decided to use what I consider key adjectives and use definitions to describe what I saw. 1. Ugly--If you were looking for a shootout, this wasn't the game. 2. Stingy Defenses--Both teams combined for 493 net yards. 3. Energy--The crowd noise could even be heard in the press box through the windows. 4. Rodney Dangerfield--Blake Bortles gets no respect from the National Media but got a win. 5. Emotional--Sellout crowd with Flag On The Field during National Anthem in this Military Town. 6. Challenging--For radio announcers calling such a low scoring contest. 7. Full--The Press Box. I met a columnist from the Toronto Sun. 8. Cooler Temperatures--Than Super Bowl XXXIX (39). 9. Painful--To watch Bills QB Tyrod Taylor getting tackled and head thrown into ground leading to a concussion. 10. Vindication--Marrone and Dareus defeat former team. 11. Dramatic--Hometown kid Nathan Peterman enters game after Taylor leaves via a concussion. 12. Gordie Howe Hat Trick, Peterman throws an interception, runs for a first down, intentional grounding penalty. 13. Chris Webber--Buffalo had no timeouts resulting in two 10 second clock runoffs, with Peterman intentional grounding and Taylor's injury. 14. Clutch--Bortles picking up a first down off a botched play, fumbled snap scrambling for a first down with under five minutes left in regulation time. 15. Smash-mouth--If there was ever a physical football game, this was it. There were some very happy Jaguars and here is what some of them had to say. Dareus had four tackles, three solo and one for a loss. When I approached him, he remembered me from our last conversation and he had a smile that went from Jacksonville to the North Pole. "It was nice defeating my old team and I wanted to give whatever information to the coaches," Dareus said. "Whatever they wanted to use, it was up to them. "It's nice to continue playing and the energy in this stadium was tremendous. To feed off the fans the way we did was great. It's something to play in front of a small market where you're the only team in town and watch the community get behind this team. I was just hovering over the whole atmosphere and trying to live in the moment. "I've really enjoyed my time here and I'm glad the season isn't over. We have more work to do and I'm looking forward to the next game." Marrone knows how far this team has come in the past year. But for a guy that's pretty even keeled and downplayed the revenge Buffalo match-up during the week, it wasn't hard to tell that he's pleased that there won't be any exit interviews this week. "Like I told our team, it was a hard fought game on both sides, both teams. Credit, obviously, to Buffalo. They did a heck of a job today. They played their butts off. I thought we played hard too and at the end of the day we were just able to make a couple of plays. "Playoff football is about you just going out there to win. No one was trying to win a beauty contest. The teams that are playing, it's going to be all out, everything is all out on the football field. Like I said, I'd be remiss not to give credit to Buffalo. They left it all out there, and I thought our guys were leaving it all out there. Each week it's a different story, you know what I'm saying, in what you want to do. "Each week is going to be geared toward doing the best job you can, but it still goes back to the same thing we've been talking about all year. It's going to be your performance on that day, and what you're able to do, so obviously we're going to have to do some better things going forward." Defensive end Yannick Ngakoue was asked if this felt like a game that one play could make a difference. "Yeah, definitely. I just felt like from the start the defense came out and we did what we were supposed to do. All 11 guys flying to the ball, had a little bit of mistakes, but that's part of football. You're not going to be perfect. Overall, I feel like the effort and I feel like the energy was there." Cornerback Aaron Colvin described his first playoff experience. "The atmosphere was incredible. The fans, they were rocking from start to finish, and I've just got to say thank you to all the fans that were out there that supported us today and have been around with us all year. It's a cool feeling, but at the same time, we've got bigger goals." Offensive lineman Cam Robinson talked about what it's like when Bortles breaks out for big runs. "He's an athlete, that's what it tells me. He's going out there and do whatever it takes for us to win. That's all you can ask from a quarterback is to go out there and lay it on the line every time and he does a great job of doing that every week." Linebacker Telvin Smith described his thoughts on finally getting a playoff win. "I'm telling you it feels great. I know that's simple, but it is what it is. It's simple in the formula that we did. If you put that hard work in from the front office to the players and to the coaches, you put in that hard work and you're going to get results, so that's all you see. Right here, are the results of hard work." Cornerback A.J. Bouye talked about how Bortles handled himself. "Everything is not perfect. He finds a way to keep fighting through. He blocks out all the noise. It shows you how tough he is especially that one third-down where the ball came down. He picked it up and ran off. Things weren't perfect but he keeps fighting. He has grit. Coach Tom Coughlin talks about that a lot." Defensive end Calais Campbell was asked why this season is different than previous seasons for the Jaguars. "I don't have that answer for you, I wish I did. All I know is that this season, everybody's focused and having fun and enjoying the game, and we put the work in. This is the hardest I've ever worked in my whole career. Coach Marrone really demanded a lot out of us and the guys responded. This team is incredible and we have so many playmakers, different guys who love this game and play the right way." Wide receiver Allen Hurns had nothing but praise for his underrated signal caller Blake Bortles. "It shows who Blake is. No matter what happens he finds a way. No matter what happens during the course of a game, he has that belief that he can go down and lead us on any given drive. He wasn't able to get it done in the passing game, but that's on all of us. He made a lot of plays with his legs to continue drives." Last but not least, there is Blake Bortles. This guy won't win any Olympic Gold Medals in running events, but he probably doesn't even care. A Vince Lombardi Trophy would suit him fine. On this chilly afternoon in Northern Florida, he was asked if he ever thought he would rush for more yards than he would pass. "No, that's usually not ideal for a quarterback but it is what it is. I said earlier I kind of felt like last week I didn't run a whole lot. I don't think I ran at all so it felt like we lost and got beat with emptying all of our bullets, so I wanted to make sure that whatever happened today, if we were going to get beat or something bad was going to happen, it was going to be with us going down swinging, using every option we could. I think the wind was a factor a little bit going one way but I thought we did a good job up front and they did a good job of getting back and getting under routes, so it kind of allowed me to run a little bit." Bortles was asked if the overall experience lived up to his expectation. "It was incredible. Talking to guys on the sidelines there's not a lot of people outside of Marcedes (Lewis) that have ever seen the stadium like that. I think for us to run out of the tunnel and see all of those people out there and for the first time since I've been here to see the tarps taken off of the upper deck in the corners was real special. It was cool to be able to do this in front of our home crowd in Jacksonville, our stadium. Everyone knows it hasn't been done in a long time so it was really special to be able to do that." While Jacksonville didn't win a beauty contest against Buffalo, the Jaguars did against the Pittsburgh Steelers at Heinz Field in Pennsylvania, Sunday, 45-42. This was Jacksonville's second win over Pittsburgh in the Steelers building this season. I've maintained all-season that I feel the Jaguars are playing on "House Money." I still believe that way so it was easy for them to prepare for a rematch with the Steelers as an underdog. Especially since the Steelers (13-3) entered the game overconfident and appeared to be looking forward to facing the New England Patriots in the AFC Championship Game Sunday. Unfortunately for Pittsburgh fans, that match-up never materialized. When your Super Bowl winning signal caller Ben Roethlisberger throws for 469 yards and five touchdowns, one would think this should be a victory. But he threw for one interception and Jacksonville's defense sacked Ben seven times and the Steelers had two turnovers. If you want lots of yards, this game had it as Pittsburgh out gained Jacksonville 545-378 totaling 923 for both squads. Bortles numbers were a bit better than against Buffalo as he amassed 214 yards passing and one touchdown, plus 35 yards rushing. Bortles did an exceptional job managing the football game by not self destructing and beating himself. But Steelers nemesis Fournette was at it again as he scored three touchdowns and gained 109 yards. Jacksonville will now face the New England Patriots Sunday in Massachusetts in the AFC Championship Game. This is the Jaguars third appearance in this game, but the first since 1999. When you consider the magnitude of the Jacksonville run this season, here are some things to consider. First, former Coach Mike Mularkey was fired by the Tennessee Titans this week even though his team won a playoff game. Second, the Cincinnati Bengals are 0-7 in the playoffs since Marvin Lewis has been the head coach. Third, the Detroit Lions haven't won a playoff game since the 1991 season, their only campaign where they advanced to their lone NFC Championship Game. Fourth, Jim McMahon (Chicago Bears), Doug Williams (Washington Redskins), Jeff Hostetler (New York Giants), Mark Rypien (Washington Redskins), Trent Dilfer (Baltimore Ravens) and Brad Johnson (Tampa Bay Bucs), Jim Plunkett (Oakland/Los Angeles Raiders) proved a QB doesn't have to be a Hall of Famer to hoist the Vince Lombardi Trophy. Despite winning two Super Bowls, Plunkett's statistics are definitely not worth bragging about. He amassed 25,882 yards, with 164 touchdown passes and 198 interceptions with a passer rating of 67.5. Since his arrival to Jacksonville in 2014, Bortles has thrown for 14,928 yards, 90 touchdowns, 64 interceptions and has a passer rating of 80.8. Romo, who called the game for CBS had a 78-49 record for the Dallas Cowboys and amassed 34,183 yards. But for all of these yards, when it came to the playoffs, Romo's record of 2-4 and no Super Bowl appearance would ultimately define his career. Bortles is already 2-0 in the playoffs and has his squad one victory away from the Super Bowl. When the Jaguars returned home from Pittsburgh there was a Small Rally at EverBank Field celebrating their win. At the moment, we're getting just a Snap Shot of what Jacksonville will look like with some post-season success. I can only imagine what this town will be like should the team get to the Super Bowl, let alone win it. There is one Jaguar player who will have some hardware heading to his trophy case. Calais Campbell has been named Defensive Player Of The Year By The Football Writers Of America. Campbell, who was acquired by the team as an unrestricted free agent on March 10, 2017, started all 16 games for the third consecutive season and totaled 67 tackles, 14.5 sacks, 14 tackles for a loss, three forced fumbles, three passes defensed and one fumble recovery, which he returned 10 yards for a touchdown. Campbell set the Jaguars single season franchise record with a career-high and AFC-leading 14.5 sacks. As outsiders try to think they know the answers as to whether Bortles can lead this team to the Lombardi Trophy searching to find his replacement, the team is becoming more confident he's their QB of the present and future. The attitude in Jacksonville is Us Vs The World. The Jaguars will have it no other way. The amount of players featured in this story really paints a good picture of what's going on in This Military Town. If there is an advantage of being in a smaller market with less media and blue collar fans, this is it. What I've seen over the past year and a half is truly incredible. I'll say this, whenever the Sun Sets on the season whether it be this weekend, or perhaps after the Super Bowl, Mount St. Jacksonville is about to Erupt and the Lava is starting to come out in an area which is the "Only Game In Town." I'm very proud to announce that Candice Ebling has joined me on the editorial staff. She will make her writing debut covering the NHL All-Star Weekend from January 27-28 in Tampa. This is a move which I've been considering for quite some time. During my five-year association with Ebling, she's done an outstanding job as our photographer working extensively with the NFL, NHL, NBA, College Football Games, MLB as well as other assignments. I marvel at her creativity when she's taken photos and some of her action pictures have been off the charts. What impresses me about Ebling is her attention to detail and despite being 5-foot-3, she finds a way to overcome this and get what she needs to in order to overcome her height challenges. When we're not at sporting events, her knowledge of sports amazes me. We can have stimulating conversations that last hours and even days on certain subjects. Some will go on for weeks. When we'd go out to dinner with my parents, she would hold a conversation with my father real well and even educated him on certain topics. My father's body language and voice inflections indicated that he was impressed at how knowledgeable Candy is in sports. One of the most recent things she would talk about were head injuries in the NFL regarding Chronic Traumatic Encephalopathy (CTE) which is a neurodegenerative disease found in people who have had multiple head injuries. She's had other interesting conversations with him about other sports and while my mother feels left out watching the banter go back and forth, she still is amazed that Ebling is as knowledgeable about sports. Ebling will have a variety of assignments on this platform. I've worked with numerous women in sports through my 39 years in Sports Media, and Ebling could hold her own with many of them. We'll be incorporating a debate feature called Point-Counter-Point where we'll take sides on given issues. During my years in the media in radio and newspapers, my longtime colleague George Eichorn and I had a lot of fun with this concept. There is no doubt Candy will do well with this as well as other columns that she decides to write. She defines the word Photo-Journalist and will continue to take photos for us. When she learned of this decision, she quipped with me and said "You're having me cover a sport that I know the least about." She's done an outstanding job when Eichorn and I have thrown her into the NHL fire and she acclimated quite well. Being from the Milwaukee, WI., area, she's followed the Green Bay Packers, Milwaukee Brewers, Milwaukee Bucks as well as the University of Wisconsin and Marquette University. She never knew much about the NHL until she began hanging around me. When she informed her father, two sisters and brother of this move, they were excited. But they've known her as a photographer and not a writer. They definitely were excited for her and wondered if she felt comfortable writing. She was honest and said not really, but embraced the challenge of learning a new craft. There is no doubt that Candy has the creativity to do well with being a writer and with her knowledge and passion, this move to elevate her to Editorial Status is undoubtedly overdue and a nobrainer! Ebling, who has a Bachelors Degree in Business Administration and Finance from The University of Wisconsin-Whitewater, will find Sports Media a far cry from what she learned in college. But to get through college, she had to take an English Class and write papers to graduate. Now what better way to break in on the editorial side than on the NHL's Big Stage at the end of the month? But she'll do fine and I look forward to helping mentor her as she continues her acceleration into some more big events in the future. She won't need a lot of mentoring as long as she combines her creativity, knowledge and passion into words. I'm excited in helping her begin this journey and I hope all of you appreciate what she'll bring to the table. Up in heaven, her mother is looking down on her and is very proud of Candy in discovering she has a skill she never knew she had and is smiling. Throughout the years, I've worked my fair share of Bowl Games and there were a lot of activities to keep fans and media busy. I really embrace those memories. But I have to admit, The Outback Bowl is a totally different and refreshing experience. When I looked at the itinerary a few weeks ago, these people really get it when it comes to the KISS Theory: Keep It Simple Stupid or as I would say, Straight Forward. On January 1, 2018, I completed My Major Florida Trifecta by covering The Outback Bowl featuring the Michigan Wolverines and South Carolina Gamecocks. In the past, I've covered multiple Orange Bowls and Citrus Bowls, but this was my first Outback Bowl. During these Bowls, I've watched the likes of Miami, Florida State, Notre Dame, USC, Alabama, Ohio State, Iowa, Florida, Wisconsin, South Carolina and Michigan. There have been some interesting coaches in this group such as Bobby Bowden, Lou Holtz, Pete Carroll, Steve Spurrier and Jim Harbaugh. There were a few things that made this match-up quite interesting. The programs are miles apart in tradition. Going into this contest, South Carolina's all-time record was 600-574-44 with a .511 winning percentage and 8-13 in Bowl Games. Meanwhile, Michigan, took a 943-338-36 mark with a .730 winning percentage, 11 National Championships, along with a 21-24 record in Bowl Games into the game. That's the big picture featuring these squads. The small picture was South Carolina had a 2-1 record against Michigan and was 1-0 in Bowl Games as these two met on January 1, 2013. The Gamecocks prevailed 33-28. Would Michigan, which has been to the Outback Bowl more than any other Big 10 School with six appearances get revenge? For much of the game, it appeared that way as the Wolverines led 9-3 at halftime and built up a 19-3 lead into the third quarter. At one point, when I was looking at My MVP Ballot, I considered U-M Kicker Quinn Nordin as he connected on four field goals. Nordin's four field goals tied a school high set by Travis Fortney, against Penn State in 1999. But when it was all said and done, Michigan would let this game slip away by committing five second half turnovers. South Carolina scored 23 unanswered points in the second half and even missed a late game field goal which gave Michigan a punchers chance at the end. A crowd of 45,687 watched South Carolina pull out a 26-19 win in 50 degree temperatures and light drizzle which might have caused the smaller turnout. Wolverines freshman QB Brandon Peters threw two fourth quarter interceptions including one in the end zone which could have given U-M the lead. Unfortunately for the Wolverines, the numbers don't lie. South Carolina forced five Michigan turnovers in the win (three fumbles, two interceptions), the most in its bowl history. South Carolina's defense held Michigan to just 2-for-17 on third downs and 277 yards in the game. Michigan Coach Jim Harbaugh was asked if he felt the game slip away at any time, or did the Gamecocks get better as the game went along. "I think they did get better," he said. "I think probably both of those things. They got better as the game went on, no doubt, and made great plays to win the football game. We didn't get the knockout punch when we needed it. We didn't take advantage of the opportunities that were there." Gamecocks sophomore QB Jake Bentley would turn out to be the player who earned My MVP vote by passing for 239 yards and two touchdowns. He did win the honor as you can see him with the trophy. When I asked him about defeating a team with Michigan's tradition, he smiled and said, "Yeah, I mean, obviously Michigan has got a good history that we don't, and to be able to beat them and get a W is huge." "But building up to the game, I mean, this is a different Michigan team than it was last year or two years or back in their history. It's just trying to take it game by game, just getting a big bowl win I think is the biggest thing right now." The Gamecock's finished the season with nine wins, which is tied for the fifth highest in school history. South Carolina now leads the overall series with Michigan 3-1, with the Gamecocks winning the last two meetings, both in the Outback Bowl. South Carolina moves its bowl record to 9-13 and its Outback Bowl record to 4-1. South Carolina is now 7-9 against the Big 10 Conference. Those numbers had Coach Will Muschamp very pleased especially since he inherited a 3-9 team in 2015. "This is a really great team win for us, ninth win this year, only the seventh team in school history to do that," Muschamp said. "But all the arrows are pointing up for us. Our administration is investing in our program, our football operations building, the things that we're doing to be successful." "We're going to have those trophies soon, and I'm looking forward to our future. So I appreciate it. It's been a great week." Muschamp said the future looks bright. "I think we've made some progress. It's easy to point at tangible things and say, this is good. It helps in recruiting, obviously. It obviously helps your fan base. We've got to continue to move forward. The great thing about it is we're building, and 70 percent of our offense was freshman and sophomores. We have a bunch of really good players coming back next year." "We need to have a great off season. I told the guys, I thanked the seniors, but told the underclassmen, when you come back in January, all gas, no brakes, lets get ready to roll and that's what we need. You've got to keep pressing forward. You've got to stay hungry in everything you do, and that's what we're going to do in our program, and certainly we scratched the surface of what I think we can do." Muschamp said there were no speeches delivered on the sidelines when his team trailed 19-3. "No, I wish those worked. I'd be good at them, but they don't," he said. "No, I think that it's 365 days a year how you run your program and the culture of your program, and our guys understanding at halftime we're 9-3. We gave them short fields. We actually moved the ball against a very good defense. But you know at the end of the day, we play 60 minutes, and our guys understand that, and they keep chomping and they keep hanging in there. "They realize that when you have Jake Bentley and you have a Hayden Hurst and you have Bryan Edwards and you have some guys that are able to make some plays, and those guys are eventually going to make some plays for us, and that's why you just keep chopping and keep playing. "Never once did I feel like the game was in the balance as far as I was concerned." While Muschamp had plenty to say, Harbaugh on the other hand made it easy write down what he had to say. The Wolverines entered the game with an 8-4 record and have now lost three straight. Harbaugh was asked about the reason? "It's just being able to just sustain the momentum, keep the momentum and then get the knockout punch. That would be my thought right now." The Big 10 entered the Outback Bowl with a 7-0 record and a Michigan win would have given the conference an undefeated 8-0 mark. Nobody at the press conference asked him about this however, one reporter did ask that with the possibilities that have opened up in the NFL, is there a possibility this is the very last game you'll coach at Michigan? The Wolverines Bowl record dropped to 21-25 and 8-6 vs the SEC in Bowl Games. Michigan is now 24-9-1 against the SEC all-time. It's amazing that Michigan has played in 38 January Bowls and was playing in a January Bowl for the 16th time in the last 19 Bowl trips. The Wolverines have 10 players That Hail From The State Of Florida. Who knows how many more they'll land with Harbaugh recruiting heavily down here. While Harbaugh will not leave Tampa happy at the moment, Muschamp unquestionably did and it wasn't for just the victory, but the Entire Outback Bowl Experience. "I want to thank Jim McVay and The Outback people and the wonderful week they had for us," Muschamp said. "The great thing about this bowl game is they don't make us do 400 different things, but the one thing you do ask us to go to, I went. It was great to be there and represent the University of South Carolina in a first class manner." The only real events that I missed due to a late arrival was Clearwater Beach Day that was from 11-4 pm on Saturday, December 20, 2017. This featured the school marching bands and cheerleaders, plus tug-of-war contests. On December 31, 2017, The Battle of The Bands took place at Busch Gardens, and in Ybor City, there was a New Year's Eve Parade & Pep Rally. But I did get to the beach at 6 pm for dinner then returned the next night for a beautiful sun set. Having the game on a Monday gave me the entire weekend in an area that I called home from 1984-86 as a University of South Florida graduate. I've been to the parades in the past as well as Busch Gardens from past visits, so this business trip enabled me to weed out the obvious tourist traps. Unfortunately, I didn't have time to stop by USF this time and Busch Gardens will come another time. Instead, The Outback Bowl should be proud of the presentation they put on and we would welcome the opportunity to return down the road. I was particularly impressed with Director of Communications & Sponsorship's Michael J. Schulze. He still issues a credential for late Tampa Tribune legendary Sports Editor Tom McEwen, who died on June 5, 2011 at the age of 88. I had the good fortune to work for McEwen from 1984-86 and we'd see each other a couple times a year when the Detroit Lions were in the same division playing The Tampa Bay Bucs regularly. McEwen was an iconic figure in the area and has a street named after him near the Media Entrance of Raymond James Stadium. But it will be interesting to see how Michigan and South Carolina progress down the road. On Friday, South Carolina rewarded Muschamp for his 9-4 record with a six-year deal worth $28.2 Million, and gives him a $1 Million raise. Meanwhile, for both programs, it's off to the recruiting trail and then to spring practices leading to the regular season later in the year. It will be interesting to see whether Peters remains the Wolverines starting QB next season. Perhaps, we'll see them meet in another Bowl Game since there are SEC vs Big 10 tie-ins. But once again, if there is a Bowl Game to attend, The Outback Bowl gets my endorsement. The Football In Paradise Booklet does an outstanding job promoting the Tampa Bay Area in general so whether an individual goes to some of the organized events or not, there is plenty to do. I look forward to working with these people down the road, and these people are classy to work with. Once again, I'll be monitoring the Michigan and South Carolina Football Programs in 2018.